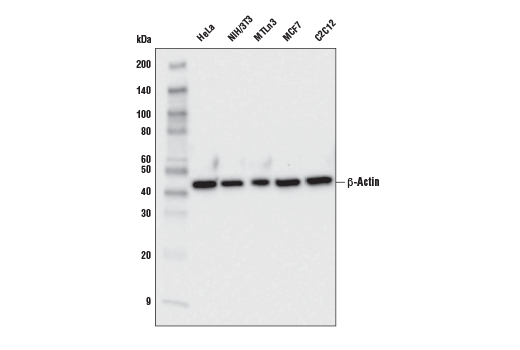 Western blot analysis of extracts from various cell lines using β-Actin (E4D9Z) Mouse mAb. 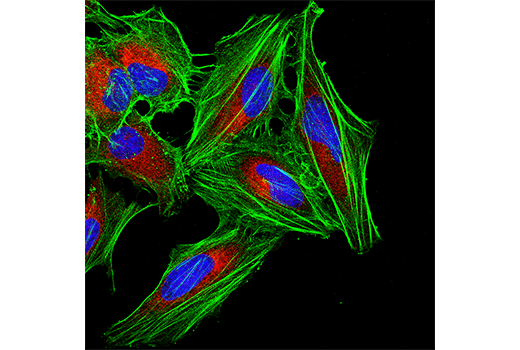 Confocal immunofluorescent analysis of HeLa cells using β-Actin (E4D9X) Mouse mAb (green) and PDI (C81H6) Rabbit mAb #3501 (red). Blue pseudocolor = DRAQ5® #4084 (fluorescent DNA dye). Flow cytometric analysis of HeLa cells using β-Actin (E4D9Z) Mouse mAb (solid line) compared to concentration-matched Mouse (G3A1) mAb IgG1 Isotype Control #5415 (dashed line). Anti-mouse IgG (H+L), F(ab')2 Fragment (Alexa Fluor® 488 Conjugate) #4408 was used as a secondary antibody. 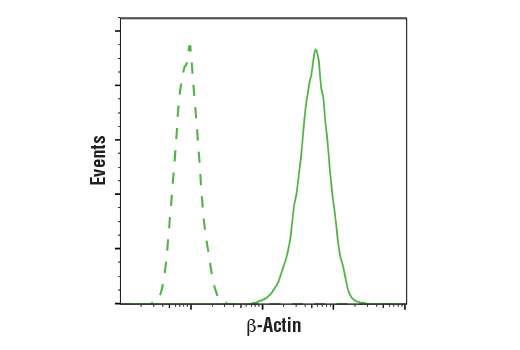 β-Actin (E4D9Z) Mouse mAb recognizes endogenous levels of total β-Actin protein. Monoclonal antibody is produced by immunizing animals with a synthetic peptide corresponding to residues surrounding Ala7 of human β-Actin protein.